Directional boring, also known as horizontal directional drilling, or slant drilling is a type of trenchless technology that involves laterally drilling to lay pipe. It is very helpful in laying pipe under rivers, existing structures, and roads for installing conduits and pipes to transport materials and fluids. The boring is widely used as it helps to transport the materials from one place to another without harming the existing ground or any other obstacle that comes between the two points. Horizontal drilling is more effective and less time-consuming than the traditional drilling. Traditional drilling makes it impossible to transport utilities without destroying the basic structure. The traditional method takes more time as well. Different types of pipes can be installed in a single location. Reduced the contamination of the groundwater pollution. No significant damage to the existing construction. Safer and more effective than an open trench. This method is ideal for surface-disruption-sensitive sites such as airport runways, heavy roadways, and golf courses. These benefits make directional boring more useful and efficient than traditional boring. This type of boring is used to install pipes and conduits in any challenging area, commercial or residential. But, if not installed with integrity and skill, even the most durable product won’t perform to its potential. 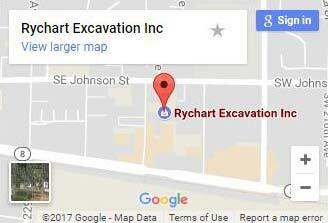 If you are looking for a reputed service, choose Rychart Excavation, Inc. We offer the best service in terms of quality, material, and method. Our team includes experienced operators and advanced technical equipment including air hammers, directional drills, and pipe fusion equipment to make the process easier and safe. Our team uses horizontal drilling techniques and methods to offer the right solution for even the most challenging underground installation project. We work with the objective of offering a safe work environment for the public and for our staff. And we provide the best customer care to build a strong, trustworthy, and lasting relationship.